2010 ( MX ) · Spanish · Drama, Action · PG-16 · 90 minutes of full movie HD video (uncut). 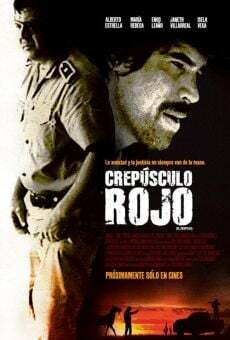 You can watch Crepúsculo rojo, full movie on FULLTV - The theft of a ranch, due to inability to pay a mortgage, causing the confrontation between two great friends and compadres: Valente, smallholder, and Dagoberto, director of police of the municipality. As only chance to save their homestead, Valente robbed a bank. A Dagoberto is entrusted with the mission to catch to enforce the law. In pursuit and dispute come to light old scores. Old friends will face a duel under red sunset sky Iturbide, Nuevo León. You are able to watch Crepúsculo rojo online, download or rent it as well on video-on-demand services (Netflix Movie List, HBO Now Stream), pay-TV or movie theaters with original audio in Spanish. This film was premiered in theaters in 2010 (Movies 2010). The official release in theaters may differ from the year of production. Film directed by Carlos González Morantes. Screenplay written by Carlos González Morantes and César Jaime. Given by Jorge Suárez Coellar. Soundtrack composed by Gregorio Hernández and Arturo Macías. Film produced and / or financed by Universidad Autonoma de Nuevo Leon, IMCINE, Estudios Churubusco Azteca S.A., Promotora La Vida es Bella and Consejo para la Cultura and las Artes de Nuevo Leon. As usual, the director filmed the scenes of this film in HD video (High Definition or 4K) with Dolby Digital audio. Without commercial breaks, the full movie Crepúsculo rojo has a duration of 90 minutes. Possibly, its official trailer stream is on the Internet. You can watch this full movie free with Spanish or English subtitles on movie TV channels, renting the DVD or with VoD services (Video On Demand player, Hulu) and PPV (Pay Per View, Movie List on Netflix, Amazon Video). Full Movies / Online Movies / Crepúsculo rojo - To enjoy online movies you need a TV with Internet or LED / LCD TVs with DVD or BluRay Player. The full movies are not available for free streaming.